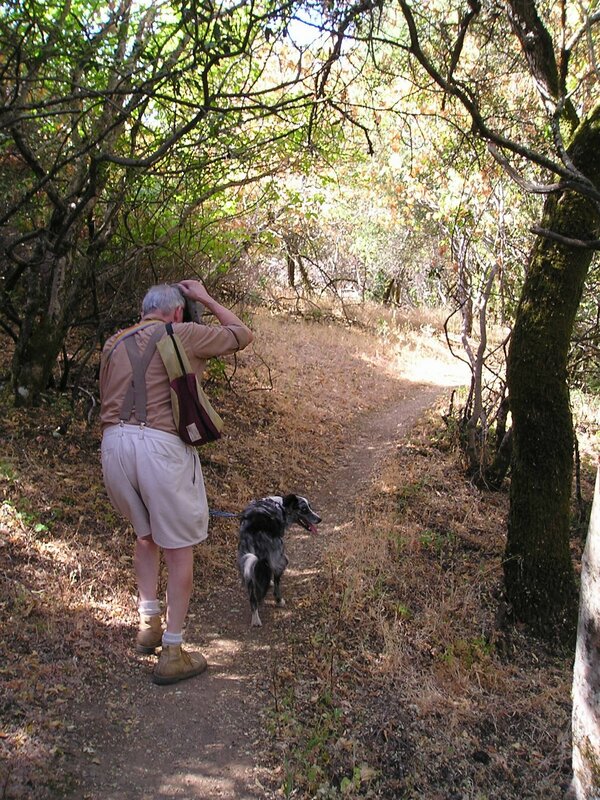 SUMMARY: Hiking with the dogs among the rhus diversiloba so green-o. Dad took me hiking today with the Beasts, and he offered to hold onto Boost while I wrestled with Tika. Boost was OK with that, as long as she checked in with me every couple of minutes. Turns out that, if I led with Tika (who pulls intently forward at all times in supreme confidence that she is the most qualified leader), then Boost pulled frantically forward in an effort to keep up. If Boost led, then Tika STILL pulled like she was the most qualified to be in front and kept bumping her nose against Dad's calves, but Boost, although she still pulled a wee bit, was more inclined to stop and look back to see what Tika and I were doing, or push back past Dad to lick Tika's face and to jump on me as if she hadn't seen me in three weeks. 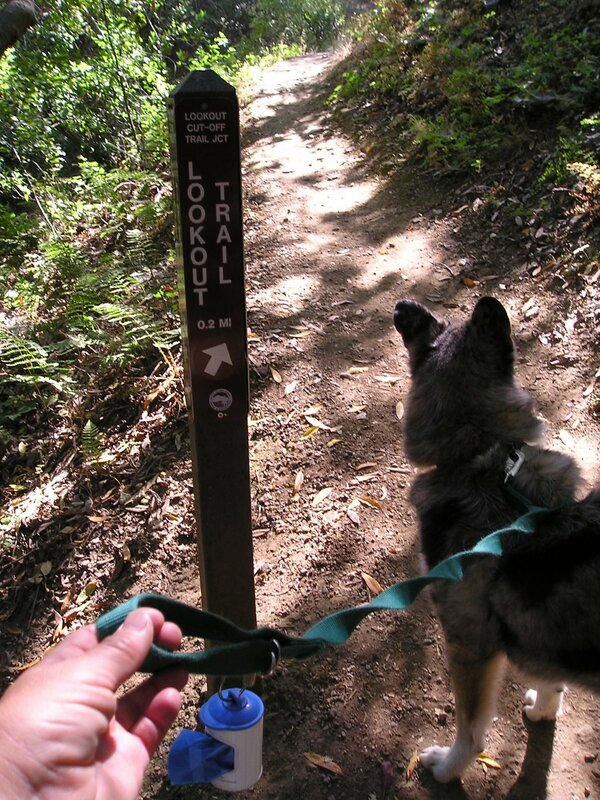 In most places, the trail was barely wide enough for one person, not even a person and a dog, so the dog would have to get its feet, face, and/or tail into the surrounding vegetation to do things like push past Dad or leap up on me. 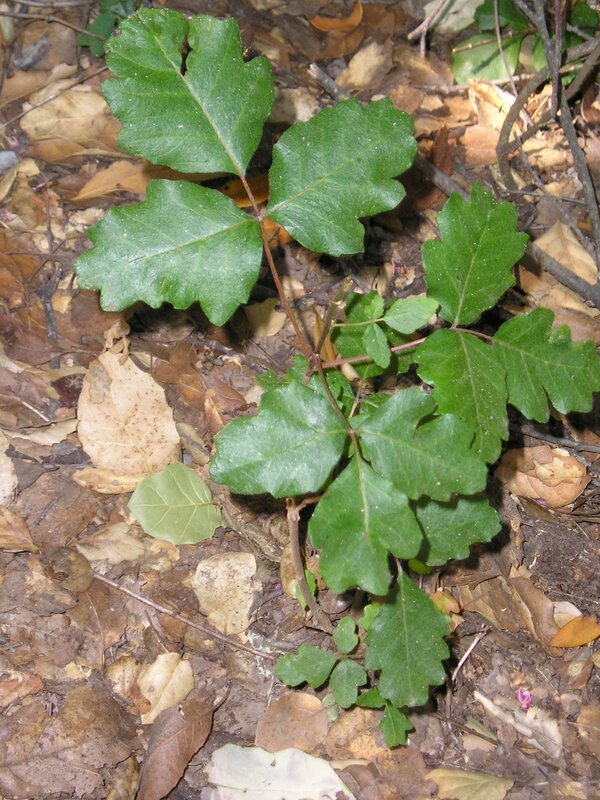 You might think that it would be OK to let the dogs flounce through the undergrowth, except that about 80% of it was rhus diversiloba--AKA toxicodendron diversilobum--but more commonly known by friends and enemies alike as Poison Oak. Innocuous-looking little guy, isn't he? Until he turns into a giant shrub or vine, sticking tendrils at all bodily levels out into the path. The trail was surrounded by it. Well--usually on one side, at least, and sometimes both. Trying to steer a dog away from leaves on one side or the other is extremely difficult from behind. 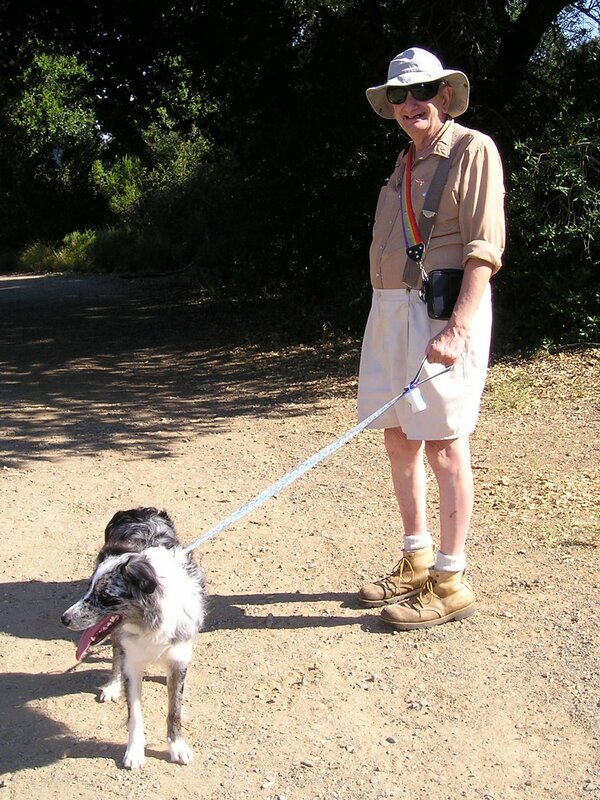 I don't believe that dogs can catch poison oak, but people can certainly get it from dogs who have frolicked therein. Fortunately there were a few places along the trail where all I had to worry about was mere foxtails and burrs. But, still, it was a nice day (much better than the last few, although still warm), and we had a few nice views of surrounding hills. 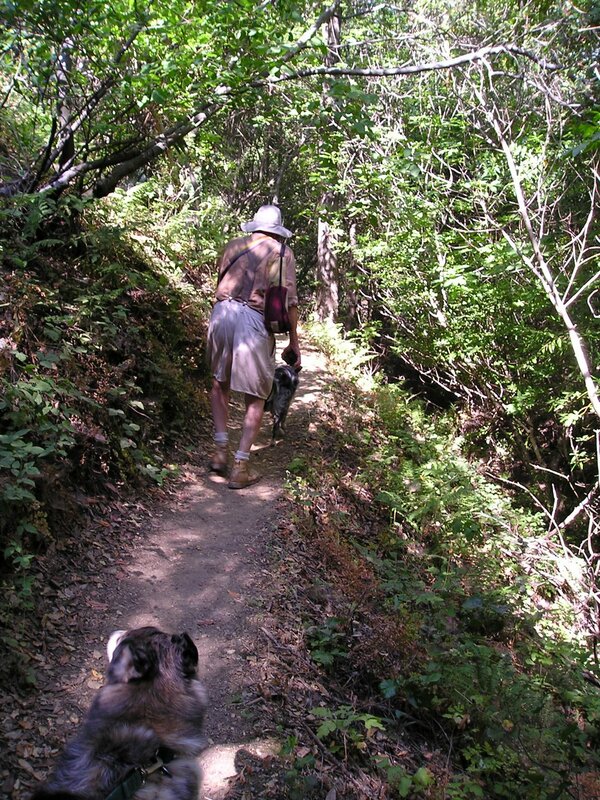 There are a ton of trails in the area that we might eventually hike, too. And it was nice to be out and moving, and the dogs seemed to like it, too. The Beasts got a good combing for burrs (lots in Boost, none in Tika) and good wet sloppy anti-poison-oak baths when we got home. Whew, that's a lot of work! A few more photos along the same lines here. Oh wow! What fun! Envious over here!!! !